Are you or a family member nervous about going to the dentist? Has a past experience with pain or discomfort caused you to start panicking when you think about having your teeth worked on? 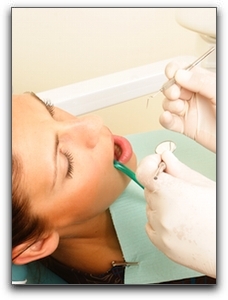 Have you neglected going to the dentist and fear the amount of work that might need to be performed? If your past or current situation is causing a lot of uneasiness, there are options available to calm your fears and reduce (or completely eliminate) your pain with the necessary services. Oral sedation (sometimes called sedation or sleep dentistry) has helped countless Ladera Park area dental patients undergo dental treatment without the anxiety. It is not an experimental procedure, it has been used safely in various forms since the 1800s. At Hales Hales Parker Dentistry in Ladera Park we will walk you through your options and provide optimal cosmetic and general dentistry service to you and your family. It is important to understand the difference between topical analgesics and sedation which are used both alone and simultaneously. Analgesics help numb the gums and nerves connected with your teeth so you don’t feel the pain. Sedation medications impact the nervous system and convey a feeling of peace and relaxation. You may choose to be minimally sedated, where you are reserved, but still awake; or you may choose general anesthesia which renders you completely unconscious. Together, these two solutions dramatically improve the treatment experience for patients suffering from dental anxiety, a very common condition. Regardless of the type and level of sedation you decide to use, our team at Hales Parker Dentistry in Ladera Park will proceed with patience and understanding. Oral sedation aids in making your dental visit serene so you can treat all of your dental troubles and restore your health. Taking care of cavities, infections, and other critical problems brings peace of mind and reduces the risk of further damage including tooth loss. At Hales Hales Parker Dentistry in Ladera Park we are happy to discuss sleep dentistry, just call us to schedule a no-pressure consultation. We’ll explain your sedation options and answer any questions. We are enthusiastic about oral health and complete patient satisfaction from the first visit through completion of treatment. We offer exceptional dental care including sedation dentistry, CEREC dental crowns and porcelain veneers. Call us today at 949-429-0049, we would be delighted to fulfill your cosmetic and general dentistry needs in the Ladera Park, California area. Looking for Affordable Teeth Whitening in Ladera Ranch?